ERIN Research Inc is a national research firm founded in 1981 by Dr George Spears, PhD, CMRP and Kasia Seydegart, MSW, CMRP. ERIN has established an enviable track record in client satisfaction research and media analysis. ERIN's groundbreaking work has been instrumental in our clients winning two GOLD AWARDS and one SILVER AWARD for innovation in management and for best-in-class performance. ERIN Research has conducted extensive studies on citizen, customer and employee satisfaction in the private, public and not-for-profit sectors in both English and French. ERIN is known as leader in using driver analyses in SQ/Client Satisfaction Research. ERIN's powerful, empirical models of drivers have assisted many diverse organizations in substantially improving their clients' satisfaction and confidence. In more than 35 years of work for CBC/Radio-Canada, TVO/TFO, CRTC, and more recent research for NFB, CTV, Canadian Teacher's Federation, organizations representing musicians and composers, and for the Global Media Monitoring Project, ERIN is regarded as a highly respected researcher. ERIN is considered an innovative pioneer in its media research approach, execution and analysis. Online Survey Hosting. ERIN’s unique online survey program allows for flexible, respondent-friendly formats that we use to deliver indepth analysis to our clients. Servers used for ERIN online hosting are located only in Canada. Kasia Seydegart received the Queen Elizabeth II Diamond Jubilee Medal recently. 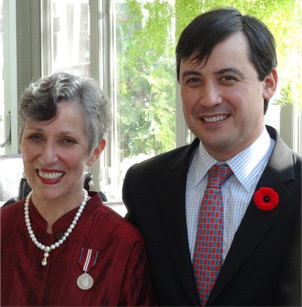 The Honourable Michael Chong M.P., representing the Governor General, paid tribute to Kasia's contribution to community. He highlighted her volunteer initiatives, particularly as founder of a thriving multi-service centre for rural residents more than 30 years ago and Chair of Bethell Hospice Foundation. In his citation, he also paid tribute to the innovative social research company, ERIN Research Inc, which Kasia co-founded with George Spears more than 35 years ago. ERIN designed and conducted this comprehensive survey of housing needs and insights of older adults who live in the diverse Region of Peel. Results accurately reflect the Peel population age 55 plus on age, gender, owners/renters, visible minorities/non-minorities, and municipality. We achieved an outstanding response rate of 36%. ERIN was able to establish the key drivers of satisfaction of older adults with their present housing. This important research has become a cornerstone of strategic planning of Peel Regional government and its community partners. Safe Quiet Lakes again commissioned ERIN Research to conduct its 2017 survey of Ontario’s Muskoka region with the support of more than 25 lake and resident associations. The 2017 survey is designed to compare the results with the baseline survey of 2013 and to expand understanding of areas of satisfaction and concern. The groundbreaking 2013 survey of more than 2,200 residents found that boating safety, along with quiet, courteous practices, underlie the quality of residents’ experience of the lakes. This holds equally for those who use large powerful boats and small craft. In 2011, 2013 and again in 2016, ERIN conducted in-depth interviews with members of TSSA’s ten Industry Advisory Councils to determine members’ perceptions and priorities. ERIN prepared individual research reports and an integrated, cross-council report.